This Thursday was the long-awaited start to Voces y Manos’ students-led community project. 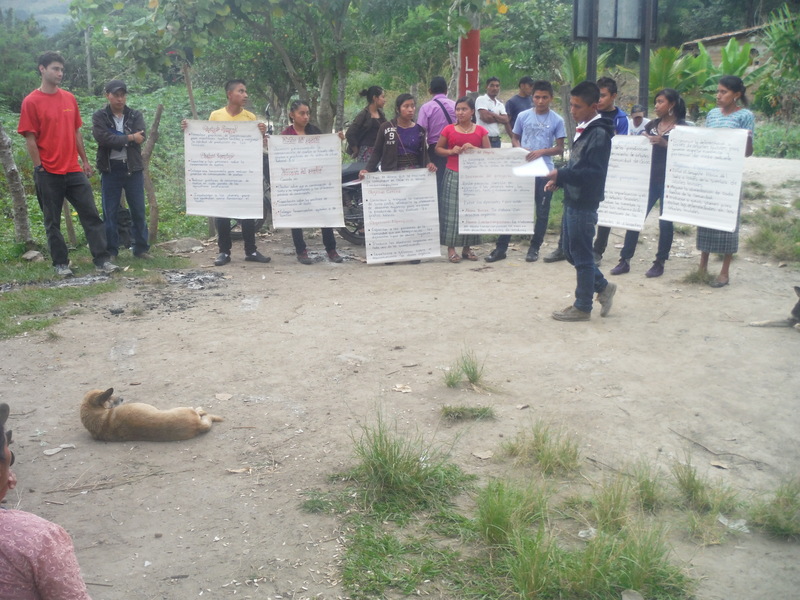 For the past month, students have led dialogue groups in the community of Chiac to build trust with community members and identify issues of importance. On Thursday, students unveiled their plans for putting into action the key issue they identified: soil loss. Readers of this blog may find themselves wondering, as I first did, why soil conservation would be a top priority in a country known more for the poverty for its people than its soil (after all, doesn’t much of Peet’s coffee come from Guatemala?). Indeed, the juxtaposition of poverty and malnutrition amidst agricultural abundance is so striking that a recent newshour story referred to the situation in Guatemala as a paradox. This apparent paradox, however, has a clear explanation: Today in Guatemala, 2% of landholders control more than 70% of agricultural lands. This highly inequitable land distribution has relegated most poor and indigenous farmers to small plots on the steep, rocky slopes where survival is precarious. Complicating matters, Guatemala is one of the ten most vulnerable countries in the world to the effects of climate change. Recent years have seen prolonged periods of drought, and particularly intense storms. This year, for example, a 6-week drought in the middle of what was supposed to be the rainy season caused subsistence farmers to lose half to two-thirds of their crops. One of the farmers in Chiac told me his family was surviving, but “raspado”, just scraping by. Within such a context, it’s easy to understand why helping farmers get the most out of their limited lands is so important. And maintaining high quality soil is critical to that endeavor. Team 1/Phase 1, Soil Conservation Practices: Students on this team explained that they would begin by leading a workshop in the community on the construction of so-called “live barriers”: plants that reduce soil runoff. Then, students explained that they would provide participating families with basic materials to create these live barriers on their own. Team 2/Phase 2, Organic Composting Techniques: The youth on this team gave an introduction to the two composting techniques they would be introducing to community members: “Bokashi Composting”, and “vermicomposting”. Students explained that, as in the previous phase, they would first lead a workshop, and then travel to participants’ homes to assist with implementation. Team 3/Phase 3, Planting of Fruit Trees: This group explained that using the compost generated by their composters, participants would be given fruit trees to plant in their community. Students explained that each family would be given a total of ten fruit trees, which would not only help reduce soil erosion, but also improve nutrition. 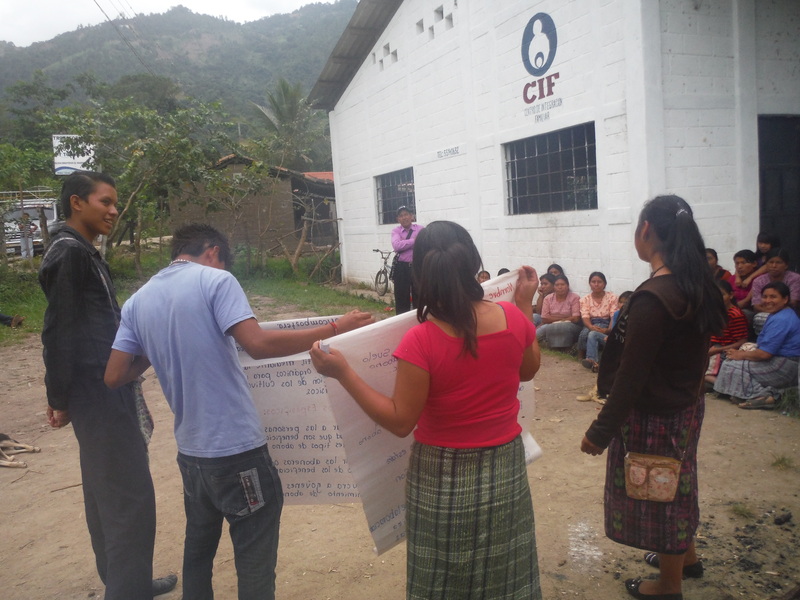 The energy in this the outdoor meeting space in Chiac was one of enthusiasm and excitement. Seeing that the issues they identified were reflected in students’ proposals, community members seemed particularly engaged in hearing the students presentations. Next week, students will lead a demonstration activity on soil conservation practices, and will then visit participants’ homes to help them replicate the project on their own.